Before the popcorn, comes the props. For that we go to prop master extraordinaire Bonnie Erb. She is in charge of getting the stage looking fit for the play. “It’s a challenge. It is not like New York City where you can walk down the street and have 100 flea markets. The dumpsters are very good to us. And then it turns into a beautiful set which is the backdrop for all of our talented and wonderful actors,” Bonnie Erb, President of the Board of Directors at Pistarckle Theater said. How could we forget the actors. This show, “Arsenic and Old Lace” is stocked with 13 island actors bringing the playwrights work to life. “I stretch I sort of meditate a little bit try to get inside the characters head, whatever it is, good, bad or ugly otherwise. It just gives me the opportunity a couple times a year to be something else,”Matthew Hamilton-Kraft, an actor at the theater added. 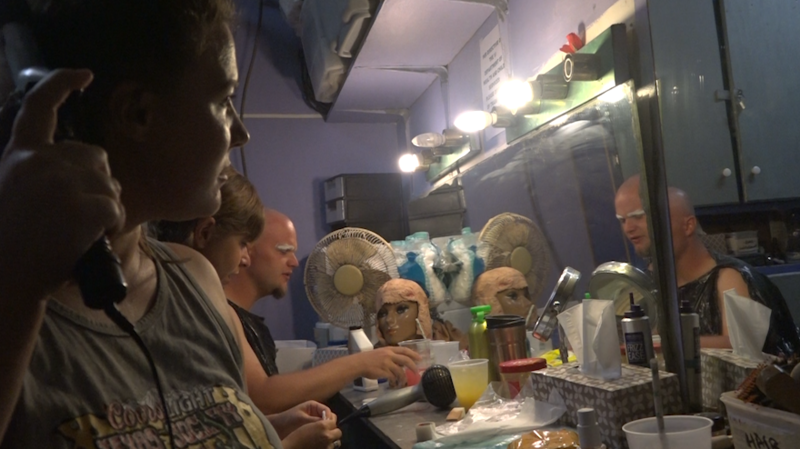 From the costumes, to the make-up, the islanders transform into their roles. Then it’s lights up. “I’ve always wanted to run a light board, I was involved in theater when I was an undergraduate, I loved theater and I had the opportunity to learn how and I’ve been involved ever since,” Rosyln Rosignol the light board operator in “Arsenic and Old Lace” said. From the settings to the sound, so much more goes into the show than the average attendee might think. But it all comes together, in time for show time.